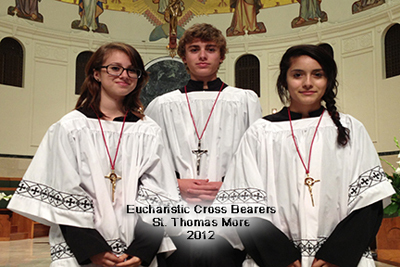 Serving at the altar during the holy sacrifice of the Mass as an altar server is a very rewarding and wonderful way to serve God and our community here at St. Thomas More. 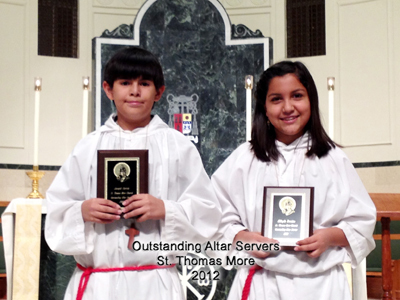 Most altar servers begin serving in third grade after their first Holy Communion and can serve all the way through high school! 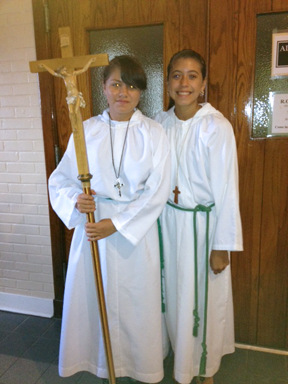 Sign up for new altar servers is usually in August and training is in September. Outside of serving at Mass, altar servers serve at our Stations of the Cross on Friday evenings during lent and we host a soup supper on one of the Friday evenings after stations. We do try to schedule younger servers with older more experienced servers until they are comfortable with serving. All of the monthly serving schedules are sent by e-mail but are also available by clicking the link on the right. We love and serve the Lord as the one body of Christ!